WTF? What business does the Obama regime have to send a ‘Muslim representative” to a British school that has been infiltrated by MuBro operatives? People, is anyone awake? Shaarik Zafar, US Secretary of State John Kerry’s special representative to Muslim Communities, met with pupils and staff at Park View – one of the five schools plunged in special measures by education watchdog Ofsted in April last year. Why not hand the policing over to the criminals? Just a tiny little mistake, right? 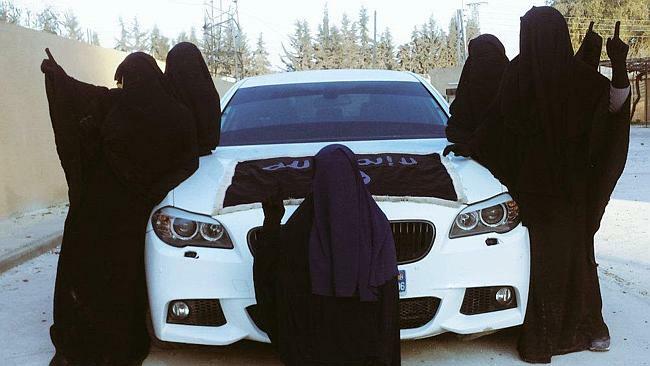 Khaled Sharrouf’s wife Tara Nettleton with other armed jihadi brides posing in front of a luxury car. 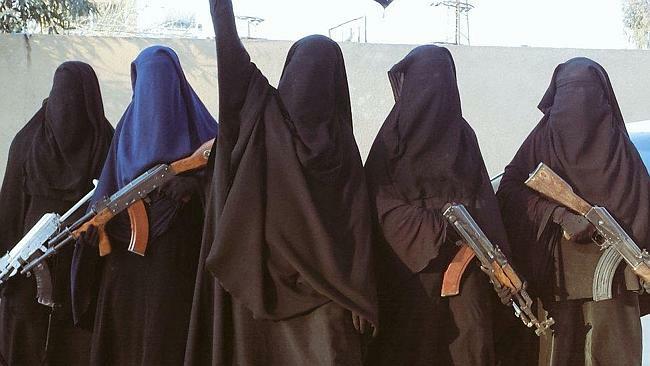 Jihadi Muslima posed for photos with other Muslim women promoting life in Syria, while her husband was out chopping heads. Now she wants to come back to Australia. 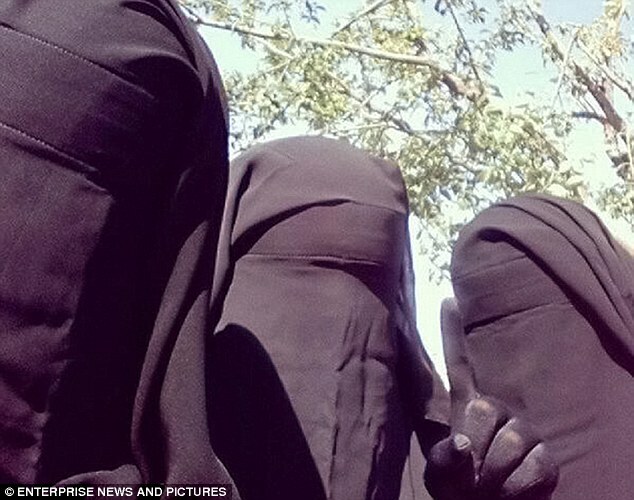 A Muslim convert, Nettleton posed in the disturbing photo with fellow widow Zehra Duman and her eldest daughter Zaynab PROMOTING life in war-torn Syria ­earlier this year. SHOCKING… Even the commissioner of the Australian Federal Police is pushing Ramadan and the Islamic agenda. A naive, deluded and misguided attempt to appease a minority. They think by helping Muslims feel franchised into society it will turn them away from following the written word of the Qur’an and the example set by the Prophet Muhammad. So our leaders are telling a ‘noble lie’, provoked by a fear that we — the general public — are a lynch mob in waiting. Which nation will be the first that bans Islam? Foreign preachers will be deported and their mosques will be shut down if they incite hatred, a French minister said. ISIS claims responsibility for the Tunisian attack that killed 39. Nothing to be concerned about. David Cameron and Boris Johnson assure us this has nothing to do with Islam. And they couldn’t possibly be wrong, and leading their country to ruin through their determined willful ignorance of the enemy’s identity, motives and goals, could they? I believe it when I see it. But some time down the line European countries will have to pull the plug on Islamisation. I don’t think it will be France, but if it happens, there will be civil war. Lots of headchoppings just like in the days of Marie Antoinette! Every visible detail about Islam is about supremacy and power, and the more the Muslim population grows in the U.S., the more we realize that Islam means submission. Although Muslims claim that there is no compulsion in their religion, their god says otherwise. In fact, because every aspect of Islam is obligatory, Muslims scramble to drop everything several times, which creates an inconvenience and sometimes unavoidable danger for unbelievers. However, the NYPD wasn’t going to allow Muslim supremacists to endanger the population in order to perform their compulsory religious duties. The New York Post reports that the NYPD went on a ticketing spree just outside the Islamic Cultural Center (mosque) located in the Upper West Side Drive on Friday. Apparently, dozens of Muslim taxi drivers and others selfishly blocked the streets so they could compulsively flock to the mosque in time for their obligatory Friday prayers. Every once in a while it is necessary to remind our friends about how we have been duped by cunning Arab Muslims and allowed them to run with the narrative. It is high time to reverse this. note that the lame stream media largely erased the two Kalashnikovs on either side of the perp.. Links between the Tunisia beach massacre and Islamist extremism in Britain can be revealed today. The fanatic who inspired gunman Seifeddine Rezgui ran a global terror network from London, a Daily Mail investigation has found. The mentor – Saifallah Ben Hassine – was himself a disciple of hate preacher Abu Qatada, then also based in the UK. Security officials are investigating whether there are direct links between Rezgui and terrorists based in Britain. But the Mail has discovered that the group said to have indoctrinated Rezgui in Tunisia over the past six months is led by Ben Hassine. And these extremists can be traced straight back to the so-called ‘Londonistan’ years leading up to 9/11. Seifallah Ben Hassine, nicknamed Abu Iyadh, the leader of Ansar AlSharia. Ben Hassine, 49, arrived in Britain in the late 1990s and quickly became a follower of Qatada, who had fled Jordan. Court papers state Ben Hassine used London as his base for founding and running the ‘Tunisian Fighting Group’ from 2000 onwards. It is not known if he claimed asylum but he was in the UK for at least three years. This story here is bunk. It never happened. They guy who cooked it up already admitted that he wasn’t even there. “The people who do these things do them in the name of a twisted and perverted ideology that hijack Islam and argue that murder is not just acceptable but necessary. … I wish the BBC would stop calling it ‘Islamic State’ because it is not an Islamic state,” he told the BBC’s ‘Today’ program. This bloke is the Neville Chamberlain of today.